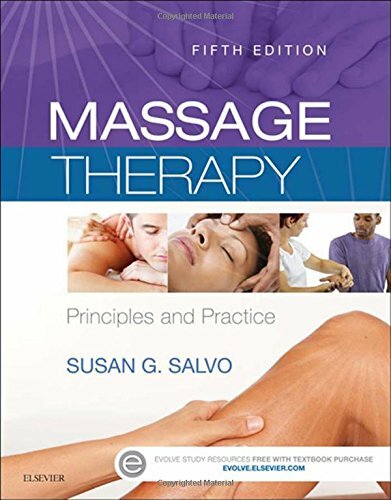 Covering massage fundamentals, techniques, and anatomy and physiology, Susan Salvo's Massage Therapy: Principles and Practice, 5th Edition brings a whole new meaning to the word 'comprehensive.' This student-friendly text boasts more than 700 illustrations and expanded sections on neuroscience, research, and special populations, plus new line drawings in the kinesiology chapter of origins and insertions that match the painted skeletons found in most classrooms. It makes the essential principles of massage therapy more approachable and helps you prepare your students for success in class, on their licensing and board certification exams, and in a wide range of therapeutic practice settings. NEW! Revised line drawing color scheme for origin and insertion matches the painted skeleton found in most classrooms, maintains consistency, and prevents confusion in learning origin and insertion points on the body. NEW! Coverage of Thai massage provides up-to-date content on the most useful, in-demand modalities that are most often requested by clients - and better prepares you for what you will encounter during training and practice. NEW! Updated text reflects changes to the new board certification exam so you have the most up-to-date, relevant information - and are fully prepared to pass the current exams. NEW! Brand new Think About It, Webquest, and Discussion features in each chapter's Test Your Knowledge section build your vocabulary usage and critical thinking skills necessary for day-to-day work with clients. EXPANDED! More content on pain theories, the neuromatrix model, and pain management, plus updated guidelines for massage after surgery and injury, equips you with essential information when working in rehab. NEW! Updated instructor resources, featuring more TEACH lesson plan classroom activities and an additional 500 test questions, provide instructors with more ways to interact with and test students.